Last spring my partner and I went looking for cider in the Yarra Valley, and accidentally stumbled on Meletos. The café is something of a joint venture; an intimate café from the owners of Stones of the Yarra Valley, sharing a space with the Napoleone Brewers. Winter is the perfect time to visit the Yarra Valley; choose a sunny day and you can't go wrong. Keeping in mind that Meletos does not take bookings on the weekend (except for groups of 8+), we arrived about 11.45am and were immediately seated. By 12.30pm the small space was packed. The café has an impressive wine list, but I come here for the on-tap cider. You can't go past the Napoleone Apple Cider, served in impressive pint glasses. The menu features a range of small share plates, larger plates, salumi and wood-fired pizzas. We started out with a few small dishes: the prosciutto, the Mount Zero Olives, and the Prosciutto & manchego croquettes. The salsa verde with the croquettes has a lovely fresh zing, and goes well with the in house bread and prosciutto. Choosing a main was difficult, so we chose three different dishes: the beef cheeks, semolina gnocchi, and the duck. We also ordered the pork and fennel sausage pizza. I usually avoid duck, but the meat was beautifully cooked, falling from the bone and delicate in flavour. 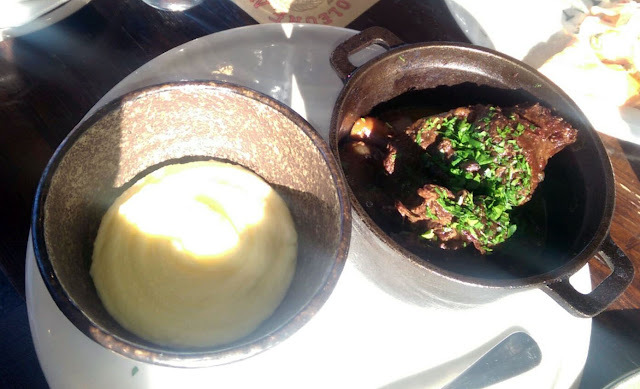 The beef cheeks came out in their own cast iron pot; rich and melt-in-the-mouth, and with a generous side of mashed potato. And the semolina gnocchi. Not quite what I expected; a single "block" of gnocchi, also in its own pot, bathed in melted tallegio and accompanied with roasted pear and little shallots. And the pizza. Perfect thin, crispy base. Minimal ingredients. No fuss, good food. Then came the offer of a dessert menu, and who was I to refuse? An easy choice; the salted caramel and chocolate tart, with salted caramel ice-cream and a generous smear of caramel. The perfect balance of sweet and salty, and a great way to finish our long lunch in the Yarra Valley. The food looks pretty good Kate, I have not made it to Meletos yet.